This Page, Parades, Gin Fiz, Midnight the Bucking Horse. 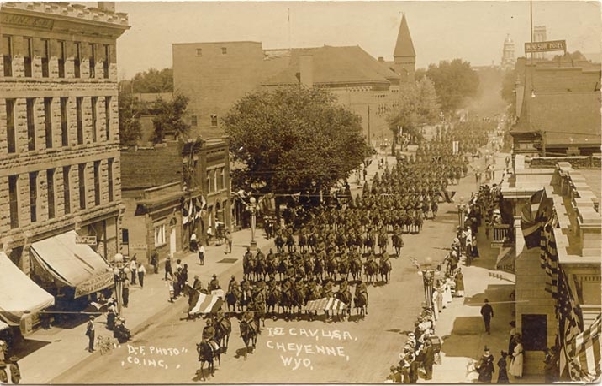 Cavalry from Fort D. A. Russell, Frontier Day Parade, 1910. 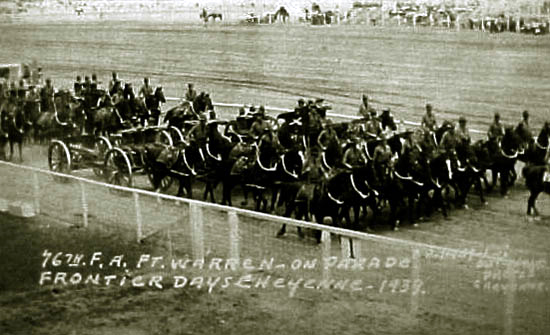 The troops from Fort D. A. Russell have participated in Frontier Days from the very beginning. The parade has, as indicated by the following photos, been an important feature of the celebration from the beginning. 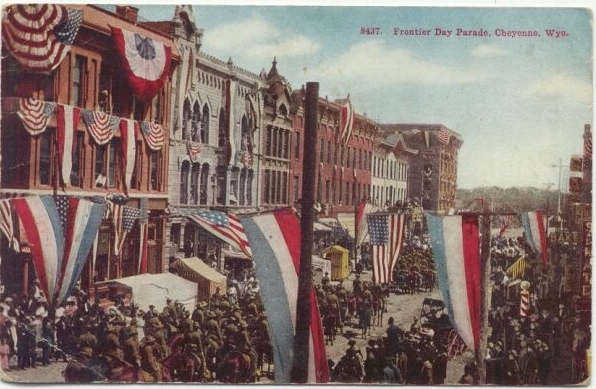 1st Cavalry from Fort D. A. Russell, Frontier Day Parade, Capital Avenue, approx. 1910. 76th Field Artillery from Fort F.E. Warren, Memorial Day Parade, 17th Street, 1937 Photo by A. E. Gordon. The 76th Field Artillery when battery "A" fired off the cannon to signal the start of the first show. 76th Field Artillery Frontier Park, 1939. Photo by A. E. Gordon. 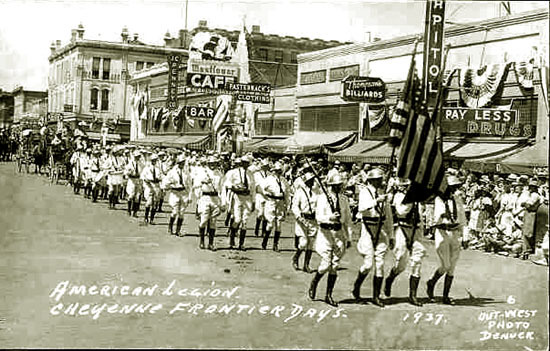 American Legion, Frontier Day Parade, 17th Street, 1937 Photo by A. E. Gordon. 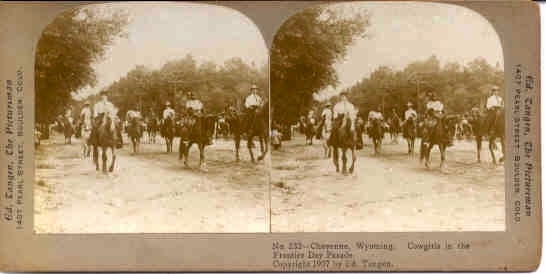 Cowgirls in Frontier Day Parade, stereograph by Ed Tangen, 1907. For discussion of Ed Tangen, see previous page. 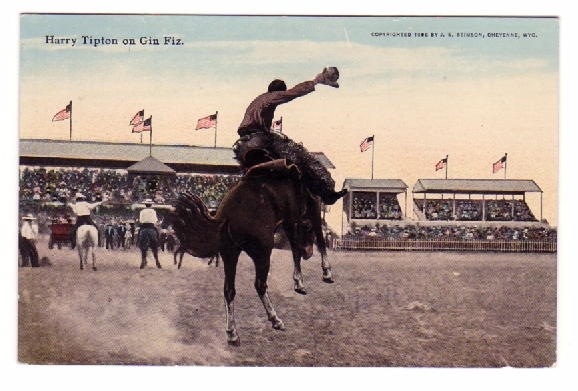 Harry Tipton on Gin Fiz, 1908, photo by J. E. Stimson. This is an exceptionally bad actor, and is considered one of the best performers. He is known as a high bucker from start to finish, usually landing his rider before exhausting his different stunts. Each "OutLaw" has some peculiar un-taught action; all its own forming an interesting study and an exiting exhibition. Event No. 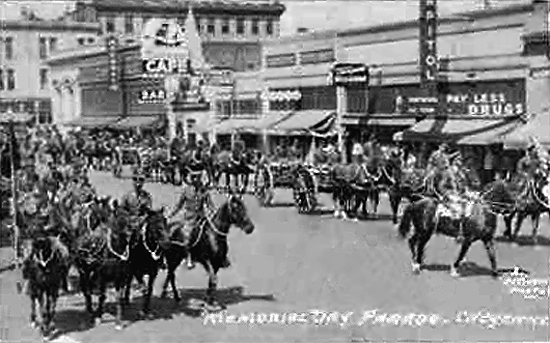 1 - Spectacular Galloping Parade of 1000 Cowboys and Cowgirls. Event No. 2 - Cow Pony Race. One-half Mile. 1st, $40; 2nd $25; 3rd $10. Event No. 3 - Indian Pony Race. One-half mile: 1st $10, 2nd $7, 3rd $3. Event No. 4 - Exhibition of Fancy Shooting by Capt. [A. H.] Hardy, champion of the world. Event No. 6 - Steer Roping. Event No. 7 - Attack and Burning of Fontier Cabin By Indians, repulse cowboys. Event No. 8 - Ladies Cowpony Race, 1st $45; 2nd $20; 3rd $10. Event No. 9 - Exhibition Drill by U.S. troops from Camp Crawford. Event No. 10 - Indian War Dance. Event No. 11 - Exhibition of Hitching and Driving a Wild Horse. 1st, $40; 2nd $25; 3rd $10. Event No. 12 - Squaw Race, One-Half Mile, 1st $10; 2nd $7; 3rd $3. Event No. 13 - Denver Post Ladies' Race. Purse, $300 and $200 cup. 1st $150 and cup; 2nd, $100; 3rd $50. Event No. 14 - Steer Roping Contest, 1st $240; 2nd $90; 3rd, $50; 4th, $20. Event No. 15 - Bucking Contest. For World's Championship. 1st, $75 and $250 saddle; 2nd, $75; 3rd, $70; 4th, $60; 5th, $50; 6th, $40. To owner of worst horse, $25. Event No. 16 - Wolf Roping. Free for All. Event No. 17 - Wild Horse Race. Half-mile Dash. 1st $75; 2nd $25; 3rd, $15; 4th, $10. Event No. 18 - Supper at KABIS' CAFE. The horses, themselves were the stars of the show. 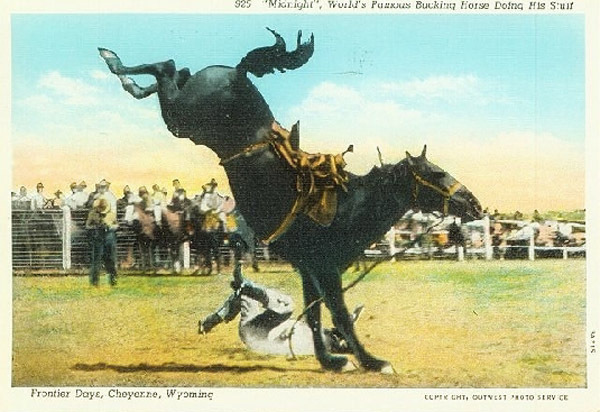 In addition to Steamboat featured on the previous page, one of the most famous of rodeo bucking horses was Midnight (c. 1910-1934). Midnight was on the rodeo circuit from 1923 until 1933. Midnight was mixed throroughbred, morgan and percheron and at his peak weighed 1300 lbs. He had been discovered by Alberta ranchman, Jim McNab when he and his top hand were both thrown by the horse. Midnight's fame was such that when Denver's National Western Stock Show added a rodeo in 1931, the star attraction was Midnight. Midnight threw all who tried to ride him. 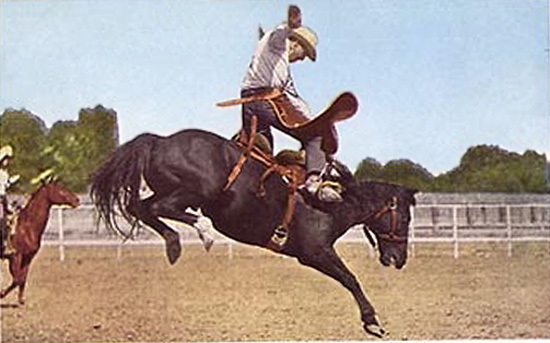 The first, a cowboy movie star, was thrown on the first jump. The exact number of men who succeeded in riding Midnight may never be known. The first to ride Midnight was Pete Bruised Head, a Canadian Indian, who rode the horse at Fort Macleod, Alberta. But then it was not an "approved" rodeo. Thus, credit for the first ride is general given to World Champion Pete Knight. 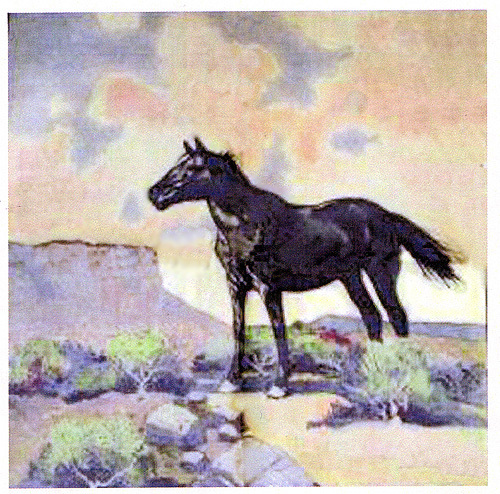 Midnight retired to Platteville, Colorado, and died in 1936. At the 1937 Denver Stock show, the crowd stood for a minute of silence in tribute to Midnight. A cowboy he counln't toss. Please God, rest his soul. Miss Dubois was the first "Miss Frontier. Selection was made by the number of tickets sold by her sponsoring organization, the Cheyenne Post of the American Legion. 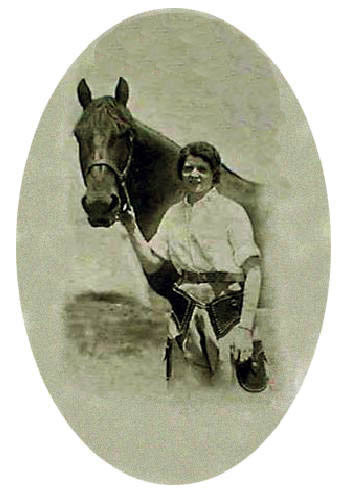 Midnight and another famous horse, Five Minutes to Midnight (1924-1947), also from Canada, were owned by Vern Elliott and Ed McCarty who are discussed on a subsequent page. Midnight throwing Carl Beasley, Frontier Days. Photo by Out West Photo Service. "Out West Photo Service" shown on the above photo was owned by Adlai Edgerton "A. E." Gordon, the photographer in the left background. Gordon did extensive rodeo photos in the 1920's, 30's, and 40's. He had studios in both Cheyenne and Denver. The Cheyenne studio was on Capitol Avenue. Five Minutes to Midnight, also originally from Alberta, was originally named Tumbling Mustard. His name was allegedly changed as a result of being slightly smaller than Midnight, only 900 lbs. Five Minutes to Midnight reired in 1946 and died in 1947. Next page: Frontier Days continued.